Notes”>Please include the map that is on the “Better! Bolder! Brighter! page of the resource guide. Feel free to edit ☺ Please use the photos from the resource guide for the cities. 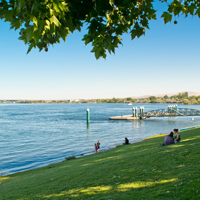 Situated at the confluence of the Columbia, Snake, and Yakima Rivers in Southeastern Washington, the Tri-Cities represent the Kennewick-Pasco-Richland Metropolitan Statistical Area in Benton and Franklin counties. Kennewick, Pasco, Richland, and West Richland make up the Tri-Cities. Then why “Tri” when there are four? The short answer is that West Richland grew large enough to deserve recognition, but the area had already been branded as the “Tri-Cities.” So think of Tri-Cities as a label for the fastest growing metropolitan area in Washington State. Since 2000, no other community in the state of Washington has grown faster than the Tri-Cities. The Tri-Cities is centrally located and linked to the major population centers of the Pacific Northwest by Interstate Highways 82, 84, and 90. Seattle and Portland are 3 ½ hours by car. The BNSF and Union Pacific Railroads have a major presence in the Tri-Cities and the Columbia River connects the region with the Port of Portland. The Tri-Cities Airport (PSC) offers direct daily flights to Seattle, Portland, San Francisco, Denver, Salt Lake City, and Minneapolis. Since 2000, no other community in the state of Washington has grown faster than the Tri-Cities. Current population estimates for Benton and Franklin counties is now 273,100. Located three and a half hours from Seattle, WA and Portland, OR, businesses’ products and services move quickly. The Tri-Cities is home to a U.S. Department of Energy national laboratory, high-tech manufacturing firms, environmental and engineering companies, and food growers and processors. The region’s workforce boasts an educated workforce with access to higher education opportunities at Washington State University Tri-Cities and Columbia Basin College. The region’s economy is anchored in agriculture, bio- and high-technology, manufacturing, service industry, and government. 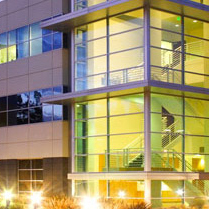 Major employers include Battelle/Pacific Northwest National Laboratory, URS, CH2M Hill, ConAgra Foods LambWeston, Bechtel National, Kadlec Regional Medical Center, Amazon.com, Tyson Fresh Meats, and Lockheed Martin. Farms cover over a little more than a million acres in Benton and Franklin Counties; potatoes, wheat, apples, grapes, alfalfa, strawberries, asparagus, corn, and hops are the largest producers. Much of this produce is shipped from port facilities in the Tri-Cities to the Pacific Rim and by Railex to major cities on the East Coast. With more than 300 days of sunshine, the Tri-Cities offers breathtaking parks, nostalgic downtown areas, upscale dining and retail options, art galleries, antique shops, and a variety of entertainment venues presenting live Broadway shows and musicals. The Tri-Cities is home to four of Washington State’s eleven American Viticulture Areas (AVAs), and over 160 wineries within an hour’s drive. Direct flights are offered to and from Seattle, Los Angeles, San Francisco, Denver, Salt Lake City, Phoenix-Mesa, Minneapolis, and Las Vegas. Live life in the Bolder, Brighter Tri-Cities!